This recipe for “Indoor S’mores” is a real blast from the past, but I updated it a bit this morning while attempting to use up some Golden Grahams and marshmallows that were lying around. Instead of making a large 9×13 inch batch, I halved it and made the recipe in an 8 inch square pan. I also used a mixture of dark chocolate chips instead of semisweet and added a topping of melted milk chocolate (Symphony Bar). These were really good, so I’m hoping I don’t forget about the recipe when the time comes to make a full batch. 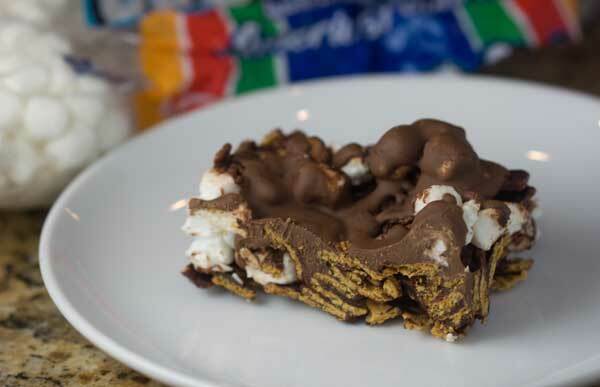 No-bake bar cookies made with Golden Grahams, melted chocolate and marshmallows. Line an 8 inch square pan with foil and butter the foil. Pour cereal in a mixing bowl. Heat butter over medium in a small saucepan until it starts to melt, then stir in corn syrup and heat until mixture starts to boil. Remove from heat and stir in the chocolate chips. Stir until melted, then add vanilla. Pour over the cereal and stir to coat, then stir in the marshmallows. Dump mixture into the pan and press down lightly with another sheet of buttered foil. Wipe the saucepan clean and add the milk chocolate. Heat on low, stirring constantly, until it’s just barely melted (don’t overheat), then drizzle over the cereal bars. Chill for a few hours or until set, then lift from pan and cut into bars. I like trimming the edges and making 8 big bars, but you can cut them whatever size you like. Wow, you made them with Bran Flakes? How neat! I’ll have to try that. Since the temps have been over 100, I needed some dessert diversity in my life. I love s’mores, so I had to give these a try. I used WW bran flakes and drizzled espresso chocolate on top. Very good. I might modify my drizzle chocolate though. Thanks for the recipie! They’re really fun. I do recommend adding that last layer/drizzle of melted chocolate, though. I love Indoor S’mores!!! Haven’t made them in ages. The group home for dev. dis. adults that I work at has 3 young men living there. They are always asking me what kind of cookies am I going to make for them. Ha. I think I know what I will try next!